My family is the biggest avocado fans. For example, on Super Bowl Sunday, my brother made guacamole with 8 avocados and we ate it all in like an hour along with tons and tons of other food. Avocados are great sliced on a sandwich, used in place of mayo, and or course made into guacamole. I found the company California Avocados Direct that ships fresh picked avocados right to your door. I contact the company and they kindly sent me a case of their avocados to try. I shared some with the other dietitians at the hospital since I had so many and they were excited to try them. I was sent a different variety that what is normally sold in most grocery stores. They are called fuerte avocados. Here is some information on this variety: The fuerte avocado used to be the "go-to" avocados until the Hass variety took over the market. Fuertes have a delicious, nutty flavor....we can get them in California, but it's hard to find them in other states. The Hass avocados have a thicker skin and ship much better in quantities for grocery stores.....so if you order a subscription from us (or a gift box) you are getting a premium, gourmet avocado that has not spent time in coolers, hasn't tumbled through a sorting machine, hasn't been poked and prodded in a store....just as though you have a tree of your own! Also, this kind of avocado does not turn black! Avocados sometimes get a bad reputation because of their fat content. People think that fat is bad for you but the kind of fat that is in avocados (monounsaturated and polyunsaturated) are actually very heart healthy. I love the versatility in avocados and that they can be made to taste like many different flavors. For example, I cut open one of my avocados last night and chopped it up and used it as a topping to my falafel and hummus wrap. It added some creaminess and a great fresh flavor. The giveaway will be for a dozen fuerte avocados from California Avocados Direct ($28 value). We're a big guac family, so I'd say traditional guacamole! I make turkey BLTs and I always put avocados on them. I eat avocado almost every day! i love it so much!! Thanks for the giveaway. I just made chocalate avocado mouse with agave. Delicious! Avocado salad is one of my favorite things to eat. Thanks so much for the fantastic giveaway! I love making pasta sauce with avocados! my favorite recipe using avocados is to dice them and put in my taco filling! I believe I could exist on nothing but avocados and water! I like making a sandwich with avocado, roasted garlic, alfalfa sprouts, tomatoes, lettuce and cheese. I love avocados, no matter what shape or form or recipe. I made some white chicken chili the other night and added avocado to the top, YUM!!! I buy them almost every week. I have to say tho, my favorite way to eat them is mashed, then on top of whole wheat toast for breakfast, add a dash of salt and pepper, perfection! I never make anything with my avocados, all I do is cut in half, remove pit, spinkle salt and pepper, dice and eat, never even get on a plate. We had some of these avocados in a Mexican soup and in guacomole. Both were great. guacamole - my mother's original recipe. Honestly, I just cut it in half, sprinkle with salt, and eat with a spoon. huge guac family! Absolutely love them and would die to win this giveaway! Thanks for the op!! I use avocados in omelets. I always make wraps and love making veggie ones with avocados and black beans! I like a sliced tomato and avocado sandwich. I like avocados with a drizzle of olive oil, salt and pepper. I love using avocadoes in a simple salad: sliced avodado, jicama, and oranges with a lemon juice dressing. Delicious! We like grilled chicken breast with bacon, lettuce, tomato and avacado croisannt sandwiches. guacamole. I never get tired of taco salad. So many delicious recipes--being from Texas, many of them Tex-Mex recipes. However, the way we eat avocados most is to simply use them chunked in salads or mashed to use on sandwiches instead of mayo. I may or may not add seasonings, depending on the sandwich, because avocados are wonderful either way. Our family loves guacamole, but for me, a few slices of avacado on a hamburger is the bomb! I love to add them to salads. I don't really do anything special...just slice them and serve. In salad with olive oil and vinegar and also guac on tacoes, etc. Ahh love avocados! i actually just tried them for the first time, so I don't have many recipes, but I like them. My favorite is on sandwiches for sure, that creaminess is the best! p.s. with this new system, do we need to add our email addresses? The way I eat them the most is just diced or sliced as a side with my meal. I do like to put them in sandwiches also. My husband makes killer guac! My favorite avocado recipes are guacamole, of course, and avocados in salads or in sandwiches. LOVE Avocado!!! I grew up eating them with just a sprinkle of salt & drizzle of olive oil. I love avocados on everything , especially in my salads. I love sliced avocados on toast, on salads, and of course, guacamole! I love avacados. I use them as mayonnaise on my sandwiches as a healthier option. I love to make eggs with avocados! Favorite - Black bean and avocado salad. I use avocados all the time - mostly just mushed up on toast with butter and salt, or on sandwiches. I love them on hamburgers, they bring out the beef flavor. I love making fresh guacamole with them! thanks for hosting! I love making a grilled salmon salad with goat cheese and avocados sprinkled with pomegranate seeds! I love to make Guacamole! Also I like to put Sliced avocados on burgers! I love Avocado Pineapple Smoothie. Guacamole! That served with tortilla chips and plenty of cold Mexican beer. Ole! i make a great salad with avocados, tomatoes, lemon juice, mayo, red onions, and hearts of palm!!! My fave is bacon,tomato & Avocado sandwiches. 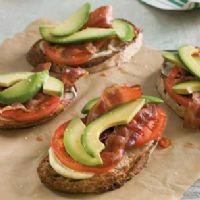 Love tomato, bacon, swiss, and avacado on toasted rye, with just a hint of dijon. Thanks. I'm a total guacamole freak!! Bacon, lettuce, tomatoes with smashed avocados instead of mayo. i like em on tacos and other mexican dishes...i'm going out to get some now!! I actually recently started eating them with my eggs and a little swiss cheese in there too. Delicious! Love fuente avocados. My favorite way to eat any avocado is on a multi grain bread, i.e. Dave's Killer Bread, toasted. Just slice 1/4 to 1/2 of an avocado onto the toast and add salt and pepper to taste! Plain and simply delicious! I love Avocado slices on a Rye bagel with cream cheese and capers. Not a recipe, but my favorite-- I love freshly made guacamole. I just mash the avocados leaving plenty of lumps, squirt in some lime juice and a little garlic powder and salt. I love it far too much. grilled cheese with avocado - yum! my family loves toastones topped with diced avacado and lime juice. I love putting avocados in my salad. I just like to dice them up and toss them in my salad. I love chicken avacado salad. I love them on everything but they are delicious on Fish Tacos! Love to put them in an egg wrap with other stuff like bacon and mushrooms. We love grilled skirt steak with Swiss cheese and avocado slices. my favourite family avocado ice cream recipe. pintworks at hotmail dot com. I love a rainbow salad with avocados! 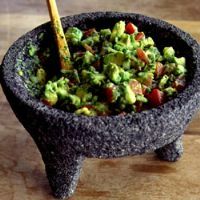 I mix chopped avocados with diced tomatoes and red onions and then squirt some lime juice in and add salt, pepper, and minced garlic. We use it in wraps or we just dip chips in it. I love putting it on my BLT. I chop up avocado and add tomatoes and cucumber and a little salt. Healthy and tastes good. I love making homemade guacamole and putting avocado on my turkey sandwiches. My favorite way to eat avocados is in a veggie wrap. I like fresh guacamole. Thanks for the giveaway. I make guacomole, I also use it on ALL my sandwiches! I love avocados! I love to use avocado slice in my veggie wraps. I love guacamole and organic blue corn chips!!! I love guacamole but my favorite is to pour italian or ranch dressing into the seed cavity and munch away. Grilled inside a black bean and cheese quesadilla. Fresh Guac with pepper and smothered on a hot pastrami grinder!!! I like to mash the quacamole, and add sour cream and some salsa to it. This makes an excellent dip. I love guacamole but my favorite way to use avocadoes is to put them on sandwiches. They make everything taste better! Ok, maybe not peanut butter. Open faced english muffin topped with red onion, tomato, avocado and swiss under the broiler. Yum! My favorite recipe is just plain old home made quacamole, but I love avocados in omelets as well with some cheese. We like to make guacamole. Or sometimes we will sliced them in half and top them with olive oil and a little sea salt.